You may call them “Bull head” or “Speedy” or “Walter Wolf” or “Challenge Timer”. It doesn’t really matter, as long as we all call them “Beautiful”. Here it is 2016 and I want to start the year sharing this picture of four of my watches. 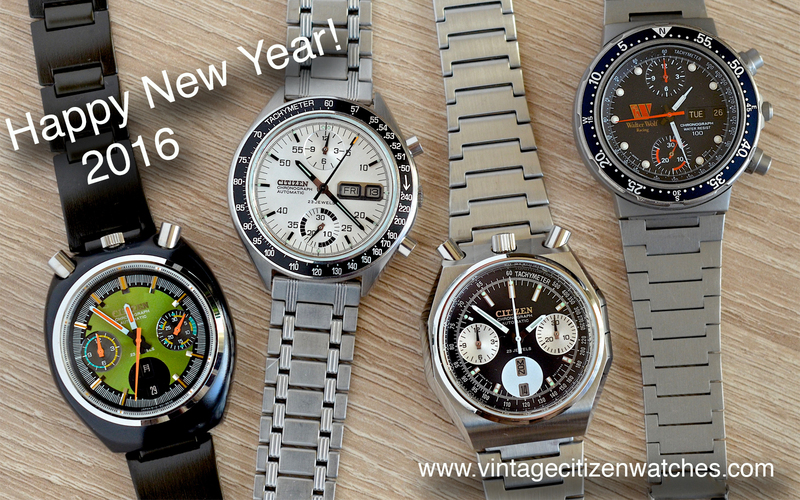 What we have here is a small collection of chronographs, all with Citizen 8110a fly back movement beating inside. Because I already wrote a few articles about watches powered by this awesome movement, you can read more about this calibre HERE. This entry was posted in automatic, Citizen automatic chronograph, Citizen chronograph, hi beat, vintage Citizen and tagged citizen 8100, citizen 8110, Citizen 8110A, citizen automatic chronograph, citizen challenge timer, citizen fly back, CITIZEN SPEEDY, citizen vintage, fly back chrono. Bookmark the permalink. I just discovered this blog shortly a few days ago, while I was searching for a Speedy “homage”. I instantly fell in love with the Citizen 67-9313 8110a. I look forward to reading your article when you post it. Can’t wait for this excellent Speedy review! Hello! Well… not easy to find. Read this: https://vintagecitizenwatches.com/2016/04/10/citizen-parts-for-repair-and-restoration/ If I will see some, I will let you know.